Posted on April 16, 2010 by Katie S.
Last weekend I was invited to attend a matinee performance of “Sweeney Todd,” performed by the Cygnet Theatre. No, Johnny Depp was not featured in this version, but the amazing cast was mind-blowingly wonderful, making up for the fact that my favorite actor was not starring. For those not familiar with the story of Sweeney Todd, the musical features a vengeful barber, a cunning shop-owner, and the “best meat pies in London”. I’m not going to give it away, but those meat pies aren’t all they’re cracked up to be. The scenery used during the play completely whisked you away to the cold streets of London, and I could barely remember that I was actually sitting in a “barn” in Old Town. 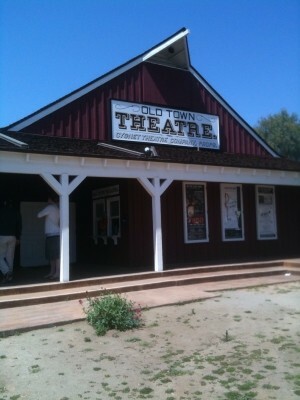 Did I mention the Old Town Theatre looks exactly like a barn? It was almost reminiscent of going to a summer stock show. After the show, my husband and I toured around Old Town listening to the live street music and looking and the fantastic old buildings. The streets were bustling with people, and it felt like I was literally transported back to the olden days of San Diego. I’d give Sweeney Todd two thumbs way up, and I promise you’ll enjoy it unless you don’t like music or theater, or don’t have a sense of humor. Sweeney Todd plays through May 9th, so if you haven’t already gone make sure to get your tickets soon! And my best tip for you: If someone offers you a meat pie while you’re there, regardless of how wonderful it might smell, please pass. It’s for your own good. This entry was posted in Arts & Culture, Insider Tips and tagged cygnet theatre, old town, Old Town Trolley by Katie S.. Bookmark the permalink. I’m a 25-year old arts and culture nut who loves animals, grammar, live music, farmer’s markets, hysterically bad movies, anything that smells like pumpkin, shoes and Chipotle. I’d start my day with a breakfast burrito and a morning run on the beach at Fiesta Island with my dog. Then I’d bring a picnic lunch to the Japanese Friendship Garden, and end my day rocking out at a concert. I love shopping at the kitschy stores in Hillcrest and finding great deals at the outlet malls. Shopping is an outdoor activity, right? I’m a vegetarian, so I’d have to say veggie burgers and beer. My favorite is the veggie burgers at the Wild Note Café that are made fresh with hummus.